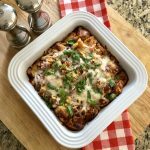 BBQ Turkey Pizza Casserole is a wonderful dinner treat and is super easy to make! We use biscuits from a can! 2 cups shredded mozzarella, we used half and half and mixed it up. Spray 13×9 or 8×8 pan with cooking spray. Separate and cut each biscuit into 8 pieces. Place cute biscuits, bbq sauce and 1 cup of cheese in a large bowl. Toss until biscuit pieces are coated. Add dough mixture to greased pan. Top with turkey and remaining cheese. Bake for 20 to 25 minute in 13×9 pan or 25 to 28 in the 8×8 pan. Bake until golden brown and biscuits are cooked through. Remove from oven, let se]it for 5 minutes. Serve warm. Garnish with fresh chopped cilantro. Consider adding a 1/4 cup fresh chopped vegetables of your choice. We love red onion and bell pepper. Remember that anything you add can change how long the biscuit dough takes to cook.